The winners of the Vietnam Heritage Photo Awards were announced at a ceremony on Thursday in HCM City. The first prize for the Single Photo category was granted to the photo Khoanh Khac Ha Long (Ha Long's Moment) by Nguyen Phung Chi from Bac Ninh. from Bac Ninh won the first prize of the Single Photo category. The Mua Tren Pho Co (Rain over the Ancient Town) by Tran Thi Tuyet Mai won the second prize, while Nang Som Cua O (Early Morning Sunshine at the Old Quarter's Gate) by Ngo Du and Vao Vu Moi (New Crop) by Vu Chien shared the third prize. In the Photo Essay category, Tay Nguyen Mau Xam (Dim Central Highlands) by Ha Noi-based photographer Na Son bagged the first prize. Le Hoi Vat Cau Bun (Mud-Ball Fighting Festival) by Pham Van Lu won the second prize. A photo by Huynh Van Nam depicting the Cham Bani ethnic group's customs related to paying respect to their dead relatives by praying and cleaning their graves during the traditional Ramuwan festival, received the third prize. A photo by Lai Dien Dam presenting the mien (glass noodle) making tradition of Ha Noi's suburban village of Cu Da was also given the third prize. An exhibition showcasing more than 100 selected photos from the competition is open to the public at the HCM City Museum, 65 Ly Tu Trong Street, District 1 until November 30. Hosted by the Viet Nam Cultural Heritage Association in collaboration with Viet Nam Heritage magazine, the contest was launched in June and attracted nearly 3,000 photos by photographers from across the country. The contest is part of many events celebrating Vietnamese Heritage Day on November 23. Vietnamese artists won one gold and five silver medals at the 4th International Circus Festival in Hanoi on November 21. Eleven outstanding item performances had been selected for the final round out of 33 performed during the festival this year. Vietnam won a gold medal for the performance ‘Central Highland Festival’ by the Vietnam Circus Arts and Vaudeville Secondary School. Three other gold medals were given to acrobatic performances by the US artists, the hand standing act of Mongolia and the foot juggling performance of Russia. Vietnam also walked away with five out of six silver medals. There was no bronze medal this year. The organizers also gave some auxiliary prizes for excellent performances, sponsored by the Vietnam Circus Federation and the Vietnam Stage Artists Association. People’s Artist Vu Hop, head of the jury board, said that the 4th International Circus Festival was attended by many artists and circuses. All items included were of outstanding quality, especially those from the Asian region. The third Portrait Photo Festival, in which volunteer photographers will take photos of people and give them to them free of charge will be held in HCM City on December 8. The event is organised by the website yeunhiepanh.net, which is a member of American photographer Jeremy Cowart's Help-Portrait, a global movement of 13,000 participants worldwide. Help-Portrait aims to connect people through visual art. The organisers expect the portraits taken by volunteer photographers to offer a taste of urban daily life. Supported by local organisations, including Tan Binh District's Red Cross, the festival has attracted 200 participants. The Portrait Photo Festival will begin at 7am on December 8 at the Tran Nhat Duat Apartment Block in District 1. The photographers will also move to 20 shelters and open houses around the city. Organisers expect that 5,000 people will join the event. For more information, visit the website www.yeunhiepanh.net. Zing Music awards decided online by Vietnamese audiences were announced on Wednesday in HCM City. This year's list of Viet Nam's best singers has My Tam, Ho Ngoc Ha, Le Quyen, Thu Minh, Cam Ly, Van Mai Huong, Bang Kieu, Hien Thuc, Noo Phuoc Thinh and Dan Truong in the top ten. An awards ceremony will be held in HCM City on January 21. The recipients were determined by voting as well as downloads of albums, songs and video clips from November to December on the website http://awards.zing.vn. Leading sculptor Nguyen Hai died after a brain haemorrhage on Monday in HCM City. He was 79 years old. Born in 1933 in the southern province of Tien Giang, Hai was one of the pioneers and senior sculptors of his generation in the 1970s. He studied at the Ha Noi Fine Arts College. His sculptures have been set up in Tien Giang and HCM City. His work is also displayed in the Singapore Museum. His sculpture entitled Dien Bien Phu inspired from the victorious Dien Bien Phu battle against the French in 1954 won the national fine arts award and was displayed at the Viet Nam Museum of Fine Arts. The sculpture was erected in the centre of Dien Bien City, northern province of Dien Bien, to mark the 50th anniversary of the victory. He was awarded the Ho Chi Minh Prize in 2000. The fourth Tea Cultural Week, a biannual ritual that honours the centuries-old Vietnamese tradition of tea drinking, will take place in the Central Highlands province of Lam Dong from December 21-28. Tea producers from different countries will take part in an international conference about the artistic aspects of tea. A street parade, a visit to tea gardens and a tea-collecting contest will be also organised during the event. These activities will mainly be held in the province's districts of Bao Loc, Bao Lam, Di Linh and Da Lat City. Lam Dong has an area of 26,000ha for growing tea trees and has become well-known across the nation for the diversity of tea brands produced there. Jazz saxophonist Sophie Alour of France will perform at the Institute for Cultural Exchange with France (IDECAF) in Ho Chi Minh City on December 4. Tran Manh Tuan, another popular jazz artist, will accompany her on several pieces. Alour is an accomplished side player who has performed with famous artists such as Wynton Marsalis, Rhoda Scott and Aldo Romano. After first studying clarinet, Alour picked up the saxophone on her own when she was 19. In 2001, she founded her own sextet, and released her debut album, Insulaire, in 2005. In 2007, she received the Django d'or Award for young talent. Nearly 120 photos featuring Spain's landscape and people are on display in Ho Chi Minh City from November 22-25. The exhibition, jointly organised by the Vietnam-Spain Friendship Association and the Spanish Embassy in Vietnam, aimed at celebrating the 35th anniversary of diplomatic relations between the two countries. The highlights of the show are photos of leaders during their official trips, including King Juan Carlos I and Queen Sophia’s visit to Vietnam in 2006, and President Nguyen Minh Triet's visit to Spain in 2009. In addition, there are pictures of other popular Spanish figures, like singer Julio Iglesias, tennis star Rafael Nadal and film star Penelope Cruz. 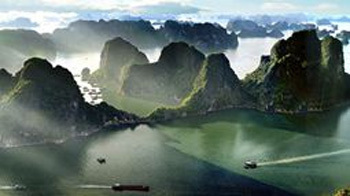 Spanish photographers' works of Vietnam's landscape are also part of the exhibit.